Allow your students to practice their understanding of place value and addition while celebrating Spring! 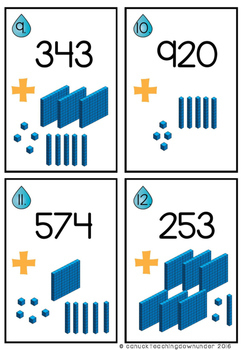 This Math activity can be used as part of Math Daily 3, Interactive Math Notebooks or Journals, Math Groups combined with Guided Math and/or as a Teacher Directed Lesson. Check out my tpt store canuckteachingdownunder to purchase other activities tailored to your diverse learners! Click on the bolded text ‘My TPT’ heading at the top right of this page. Find the ‘My Purchases’ heading and click on it. Scroll down and beside each purchase you’ve made, you'll see a ‘Provide Feedback’ button. Once clicked, you’ll be taken to a page where you can leave a rating score and provide a short comment about the product. Each time you leave feedback, you’ll earn TPT credits which you can then use to discount the prices of your future purchases! Your feedback also helps me to understand how my products are working in your classroom and for your students. You’ll find a green star beside my name at the top of this page or at the top of my store page. Once you click on this, you’ll be able to follow me. This notifies you when I post a new item and of any upcoming sales I may have. 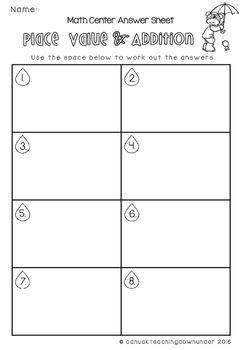 This download is for personal/classroom use only. Please do not distribute to others, rather encourage your colleagues to visit my tpt store to have a look for themselves.